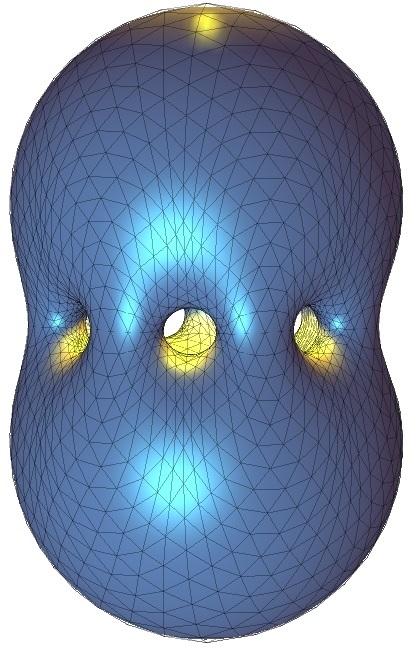 Matlab and Cuda code for computing the Willmore (W) energy, area (A), volume (V), total mean curvature (M), and harmonic energy (HE) of a Loop and C2g0 subdivision surface. The main functions are WAVM_SS() and HE_SS(). Matlab, C++ and CUDA code for discrete W, A, V, M and HE energies defined on PL surfaces. The main functions are W_PL(), A_PL(), V_PL(), M_PL() and HE_PL(). Matlab functions Wmincon_PL() and Wmincon_SS() that interface between the above functions and three general optimization solvers (fmincon, snopt and granso) for solving various constrained Willmore problems. Download the package from the link above, unzip it. At the SubdivisionLab\ directory, run >> startup . This adds all the paths to Matlab. If step 4 or 5 fails for you and if you use either Linux or Windows, feel free to contact us for the compiled .mex files. Currently, a GPU is required to run all the scripts in the paper, and the only reason is that WAVM_SS.cpp, the C++ version of WAVM_SS.cu, is not yet implemented. Without a GPU, all the scripts using a PL method can be executed. For instance, Figure (a)-(c), but not (d)-(e), above can be generated on a regular computer with no GPU. Support: Please feel free to contact the PI (yut @ drexel . edu) for technical support.